So, you came here to find out how the Battle of Oakenfall came to be? Let us start at the beginning. One day I was looking for an idea to create a comic set in Armello. Initially I wanted to either focus on the Exile or work on another comic idea (that I will keep secret for now). Yet as I was discussing with Travis Fam my different ideas I wanted to play a quick game of Armello, hoping for some inspiration. As I played I noticed a new card that I did not see before and I looked at the description. That immediately gave me one piece of information, that the King’s Guard come from a place known as Oakenfall, and that they were once known as the Retrievers of Oakenfall. This also suggested that for some reason they became the King’s Guard, after some manner of event. Before the idea of the tapestry came in with full force I first wrote a short story called Loyalty. From there the idea kept expanding on its own. How did the Lion become the King? How was Armello united? Why do the different clans react differently on the tapestry on the Main Menu screen? I proposed the idea of a Civil War and we took off from there. At first the idea behind the battle of Oakenfall was that the Lion fought an “Usurper”, somebody who wanted the crown of Armello. But there was an issue with that idea, there is no suggestion that Armello was united before. So, looking for another piece of inspiration I looked through Armello once again. 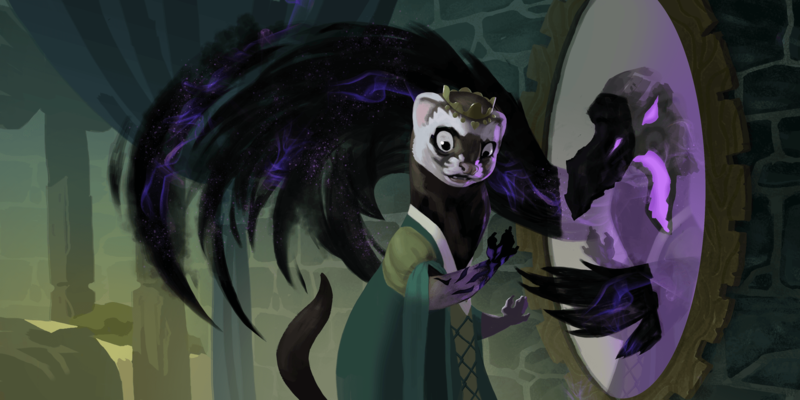 By the time I was looking for the “Villain” of what would now be known as the Armello Civil War me and Travis were constantly discussing the the layout of the tapestry, what would happen at each stage, and the details of the civil war. The Tapestry was to explain as much of the story as possible. The conflict, location and the call for help to the clans. The inspiration for the entire tapestry was meant to be the Bayeux Tapestry. Aside from the visual representation I wanted to add simple words or phrases in key places around the tapestry to highlight what was happening. As work went on I suggested: “With Two of Four at Oakenfall the Lion made his stand.”. However, as we reached the end of the project I realized that stuffing in even a single word would ruin the aesthetic of the tapestry, so the decision was reached to scrap the idea. Every few days we would look over the progress of the project, discussing each part of the tapestry. What would be the layout of the 4 clans during their meeting? What would be the composition of each army? What would the battle look like? The appearance of Nubine’s army? There was a lot of information we had to process and take into account. Before we move on to the final part of where does Nubine come into the picture here is a gallery of some of the sketches of the tapestry by Travis, and the questions and troubles we had along the way. Where will the lion be in the battle? What will the council of the clans look like? More discussion on the meeting of the clans. Early concepts of the “Usurper” Banner. Village concepts, and further banner work. The two armies charging, and the Lion’s possible poses. Further work on the tapestry, experimenting with the “wording”. A few things that we considered throughout the process is, which clans, and why, would help the Lion? Why would the Rat and Wolf clan aid, and not the Bear and Rabbit? Why would the Retriever’s of Oakenfall help the Lion? At first the motivations of the Retrievers seemed a bit muddled up in my head. Initially I thought the Lion ran to “a village” that turned out to be Oakenfall, and its people were so inspired by the Lion’s natural charisma that they decided to aid him. That, very quickly, became dumb to my ears and eyes. So instead I decided that the Retriever’s of Oakenfall were already his subjects, and that is why they were loyal to him. The Lion, for all we know, might had been a great lord! As to Nubine’s army on the Tapestry, I wanted to use a style of armor that I “knew” what it looked like but could not explain it clearly. Thankfully this picture greatly aided me in showing Travis what I meant. Why did only the Wolf and Rat aid the Lion, and not the Bear or Rabbit? This was a decision based on a bit of guesswork, and interpretation. If we look to the Main Menu Screen only two clans are bowing to the Lion, that being the Rat and Wolf. The Rabbits do not bow, and instead they seem to be offering aid, or guidance. Meanwhile the Bears are far to the right, standing proud. I interpreted this as the relations between the Lion and the four clans. The Wolf and Rat were closest to him, perhaps fighting with him from the beginning. The Bears were reclusive, more devout Wyld followers than nobility looking to wage war over “Land and Gold”. Meanwhile the Rabbit Clan (the only other clan visible with a crown) might had thought itself equal or even greater than the Lion. Such little political tidbits make the world feel more alive. Why would all of the clans decide to help the Lion, if the land is, as a whole, divided? The Medieval Ages were not a fairy tale, and some of the political ideas here came also when playing Crusader Kings 2. In the Usurper’s Trailer he says one key phrase that made me think, “Holy dang, this Civil War might make more sense than I thought!”. The Defender of Armello. Whatever the King did he was not only protecting his head, he ended up protecting the entire land, so a major threat was needed, and not just an “Usurper”. Furthermore the King is blessed by the “Moon, Sun and Wyld”, and if you add to this the lore of some of his items (that you find in the game) it would suggest that he ends up fighting the Rot somehow. The lore on her card, her appearance and position could suggest that she was a real threat to stability. The Rot/Corruption managed to bend her mind so much that she was intent on conquering all of Armello, and who knows what she would had done next if she succeeded! The Civil War would start with a bang, Nubine gathering a massive army, and then, with no warning, attacking everybody. The Lion was her closest neighbor, and if you were living peacefuly in your castle, with no need for spies or informants you could not anticipate your ferret neighbour suddenly showing up with an army, intent not on just defeating you, but killing you as well. Even if the news of this first battle spread how would the other nobles of Armello react? Most likely not at all. Perhaps petty squabbles between lords were a common occurence? But the Rats and Wolves knew better. The Rats are cunning, and the Wolves would had no doubt understood that if somebody gathers such a massive force they are not going after just one opponent. But just like in the case of the Lion, at the very start of the Tutorial, I doubt anybody understood, or knew, that Nubine was corrupted. It was certainly an act of unjustified aggression, but nobody was about to ask Nubine about her reckless attack. Finally, the size of the Battle of Oakenfall. At first I thought it would be two large armies facing off, but that was out of the question. That is why, in the “tale” Nubine divides her force to find the Lion, and one of these splinters ends up engaging the Lion at Oakenfall, instead of her full force. Why didn’t the captain of the mercenaries return to Nubine? Pride, possible riches, fame. History is filled with strategic blunders as well as poor decisions, and I thought that this battle could be an example of this. Two more things that are left to be said. On the Main Menu Screen the Lion has a golden mane instead of a black/dark one that we used on the tapestry, but a dark mane among lions (in our world) is a sign of strength and health, so we stuck with it. Why are the Peasant spears curved? This was inspired by real-life weapons used in Poland by the “Kosinierzy“. While the War Scythe was used before the times of the Kosinierzy it was best known to me from Polish History. Any and all questions will be answered here on this page.